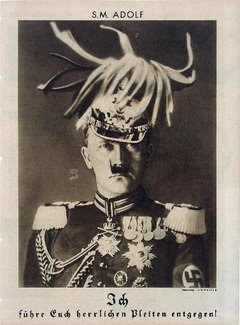 Between 1930 and 1938, Heartfield lampooned the rise of the Third Reich in 237 bitingly satirical photomontages published in the widely circulated Arbeiter Illustrierte Zeitung, the Workers Illustrated Newspaper, known as AIZ. As might be expected, Heartfield's work got him into serious trouble with the Nazis. In April 1933, Heartfield narrowly escaped arrest by the Gestapo. The artist, who was only slightly taller than 5 feet, climbed out of his apartment window and hid inside a scrapped barbershop sign on a neighbor's ground-floor patio, said Andres Zervigon, a Rutgers University assistant professor who is writing a book on Heartfield. The artist then fled to Prague, where AIZ had already relocated. Between 1979 and 1991, the Akron museum obtained 40 individual Heartfields published in AIZ, along with entire issues of the magazine, making it one of a handful of museums in the United States with substantial holdings in Heartfield's work.